Lacy Marie Crocker has settled into a comfortable groove back home in New Orleans, and with Valentine's Day right around the corner, she's busier than ever running a thriving pet boutique, helping her mother organize the upcoming National Pet Pageant, and untangling her complicated love life. But when delivering a king-sized order of dreidel-shaped doggy biscuits for a Saint Berdoodle's bark-mitzvah, Lacy stumbles into yet another murder scene--and the last person to see the victim alive was her own father. 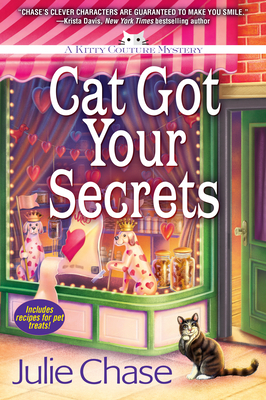 Time's running out in this deadly cat-and-mouse game in Cat Got Your Secrets, the delightfully funny third novel in Julie Chase's Kitty Couture mystery series, perfect for "all those feline fanciers who love to read Rita Mae Brown" (Suspense Magazine). Julie Chase is a mystery-loving pet enthusiast who hopes to make readers smile. She lives in rural Ohio with her husband and three spunky children. Julie is a member of the International Thriller Writers (ITW) and Sisters in Crime (SinC).